Assistants: Angelika Aleksieva, Pascal Berthelot, Zoe Bonerbo, Alexander Boyer, Martha Bromby, Mathieu Charette, Luke Currin, David Davey, Jean Demers, Steve Dumont, Marcel Gahbauer, Shannon Gailbraith, Nicole Guido, Alison Hackney, Lisa Keelty, Marcel Lebeau, Barbara MacDuff, Asya Malinova, Francine Marcoux, Betsy McFarlane, Phillip Mercier, Emma Nip, Catherine Russell, Clémence Soulard, Patricia Stotland, Natalie Thimot, Elise Titman, Rodger Titman, Christiane Tremblay, François Villeneuve. Notes: Week 9 at MBO this year was most unusual. Although a few of the trees on the forested slopes overlooking MBO are finally showing patches of yellow, the limited advance of fall colours is even more conspicuous than last week. Meanwhile, it almost seems as if the birds are waiting for that change to progress, as the count of birds banded this week (174) was a record low for the period, and by a long shot at that (the previous low was 263 in 2015, while the record high was 1112 in 2008 and the mean over the past decade was 530); windy conditions for much of the week no doubt had some effect on driving the capture rate to its lowest level ever for week 9. 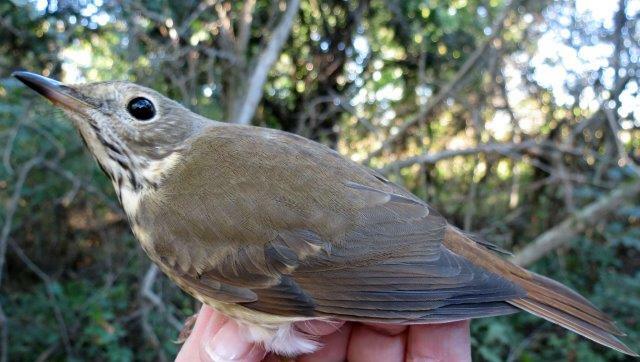 The 77 species observed this week is lower than has been the norm for week 9 over the past four years, but close to the long-term mean at this point in fall..
Three species banded this week were new for fall 2015 – Winter Wren, Hermit Thrush, and Orange-crowned Warbler; the wren and warbler were both new for the entire year in fact. As well, four species were observed for the first time this season – Cackling Goose, Hermit Thrush, Orange-crowned Warbler, and Fox Sparrow; only the goose was new for the year. More than three times as many White-throated Sparrows were banded this week than any other species, and this marked the seventh time in 11 years that the species was the most banded in week 9. However, reflecting the overall low numbers this week, the 51 White-throated Sparrows banded is just barely ahead of the record low for week 9 (49 individuals in 2011). Conversely, the 16 Blue Jays banded was behind only last year’s record high count of 23 in week 9. 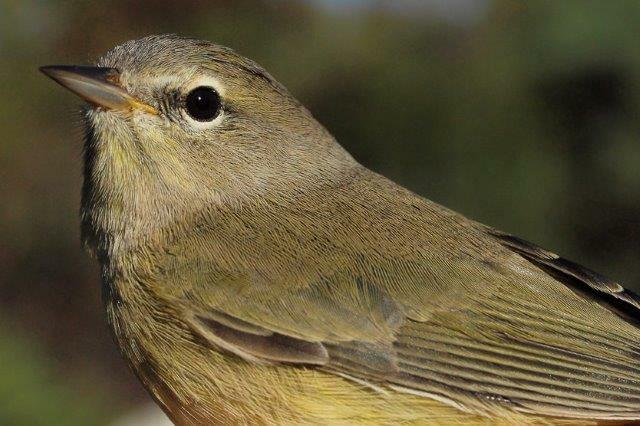 The most notable result this week was the low number of Ruby-crowned Kinglets – fewer than one-third as many as the previous record of 45 set in 2007 and matched in 2009 and 2014. Similarly, the 10 Yellow-rumped Warblers banded this week was a record low for week 9. However, Slate-colored Juncos are appearing on schedule in typical numbers, and although the Swainson’s Thrush migration is finally nearing its end, the number banded this week remained well above average. 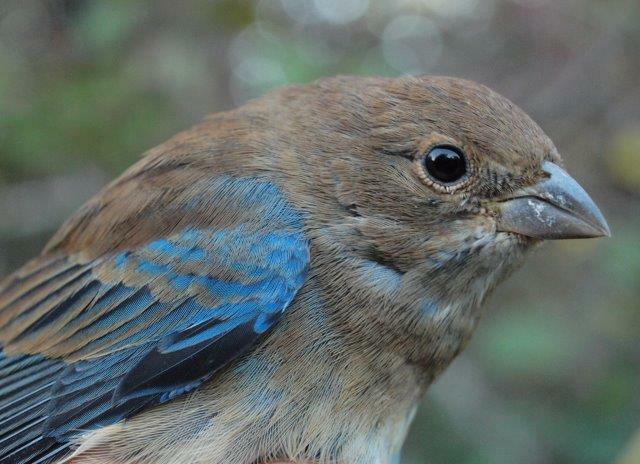 Among the rest of the top ten, the most interesting results were the two “blue birds” tied for tenth place – Black-throated Blue Warbler and Indigo Bunting. In a rare event, the top five species observed this week were all the same as last week, although for each of them the mean daily count increased compared to week 8. As in every previous year, Canada Goose was the most numerous species during week 9. The count of Blue Jays was well above average, matching the number observed in 2012, but below the high mean daily count of 94 in 2010. Our observations are consistent with reports of large counts of Blue Jays migrating through southern Ontario – more than 10,000 per day in some locations along Lake Erie! Most notable among the other species was Yellow-rumped Warbler, which remained among the top ten species observed this week even though relatively few were banded, reflecting that persistent winds through much of the week likely affected banding rates. Last but not least, this week marked the start of our six-week owl banding season, with effort scheduled nightly (weather permitting). As expected, the early results were modest, with 5 Northern Saw-whet Owls banded, plus a recapture of an individual banded in South Hadley, Massachusetts in fall 2013, and now three years old.